Yet another time to look at what the trouble with writing is. 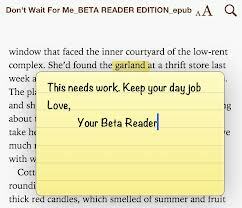 This week, we’re looking at beta readers. I admit, I thought I would have no problem finding twenty people to beta read. Yeah, twenty. I didn’t see it as a big problem… Life tends to get in the way for a lot of people so they never get back to you. It happens to me all the time. I only thought of eight people. Well, at least I have them. I’m actually glad to not have an overwhelming amount of people to be reading, because honestly, it terrifies me to think that these eight people will be the first people to be reading my book. What will they say? What will they think? Oh, my anxiety is starting to rise again. I hope to not worry about what they think too much. All I’m wanting is to get my book to be the best it can be, and starting Friday, I will have people having me do that. That’s the trouble, though, isn’t it? As authors, we want people to see our work, but we don’t want to have them pick it to pieces. Really, it’s a catch-22.